An old mountain man in Arkansas was sick and bedridden. He had not been outdoors for a few weeks and had a sharp craving for a meal of wild squirrel. He summoned his half-idiot son into the room and instructed him to go squirrel hunting and bring him back a squirrel or two. He also told his son to be very careful not to shoot the squirrel in the head as he would need its brains later to "tan" the squirrel's pelt. (Tanning a skin using the animal's brains is a common practice in certain areas, it generally takes about one brain to tan one skin). The idiot son spent most of the day searching the woods for tree squirrels, but was not having any luck. Finally, high up in a sweet-gum tree, he spotted a squirrel's head sticking out from a hole. He remembered his Pa's admonitions to save the brains. After deciding he may not have another chance, he shot it in the head, thus ruining the brains. r His sick Pa was upset, "I can't tan that skin without no brains!" he said, "Now what am I a gonna do?" Thinking quickly, he remembered that up on the river there were 3 fisheries biologists doing some field work. 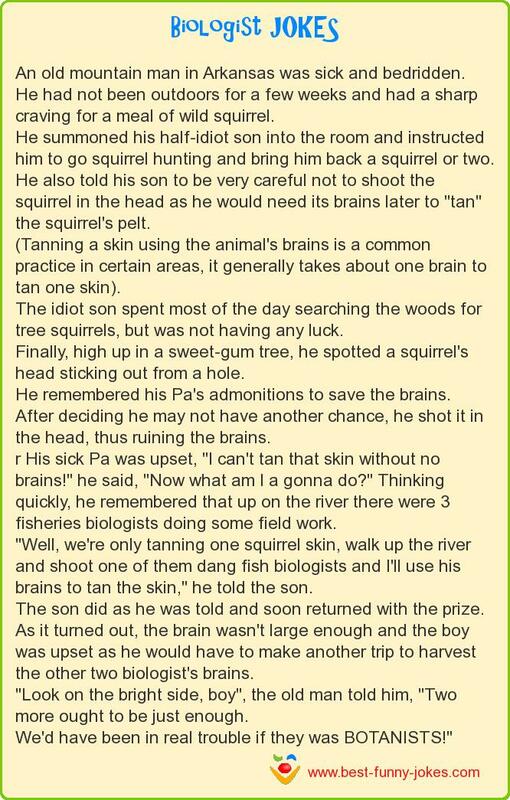 "Well, we're only tanning one squirrel skin, walk up the river and shoot one of them dang fish biologists and I'll use his brains to tan the skin," he told the son. The son did as he was told and soon returned with the prize. As it turned out, the brain wasn't large enough and the boy was upset as he would have to make another trip to harvest the other two biologist's brains. "Look on the bright side, boy", the old man told him, "Two more ought to be just enough. We'd have been in real trouble if they was BOTANISTS!"